Part I: The first surrealist I choose is René Magritte. René was one of the most famous surrealists of all time and gained most of his fame during his 50’s. Magritte was known for changing everyday situations to make the viewers take a closer look and think about the meaning or message behind the art. He was born in 1898. Magritte was from Belgium. This piece is one of Magritte’s most famous pieces. 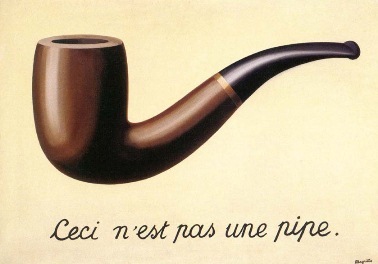 It is a picture of a pipe that is drawn in great detail on a blank background, and under it, it says ‘Ceci n’est pas une pipe’ , which is french for ‘This is not a pipe’. It says this as a surprise because obviously it is a picture of a pipe, but when you think about it, it isn’t an actual pipe, it is only a painting of a pipe. I think this piece of art is actually painted very well, and has a good idea behind it because it is something that whoever sees it will have to think about it for a while before they understand it. This is a painting called ‘The Pilgrim’ and it is a man in a suit on a blank background, but his face and head are outside of his suit and are just floating next to what seems to be his body. I like this painting because it is quite surreal and seems like they are separating the person from their clothing. It seems kind of like something you would see in a dream. This is another one of Magritte’s most famous pieces, and it is called ‘Gonconda’. I am not sure what Gonconda means, but this seems to be a painting of men floating in the sky staying still or that they are falling down like rain. I like this painting because it is definitely surreal and has a lot of detail for every man. It seems like something you would see in a funny clip or even a dream. It also kind of reminds me of the song ‘It’s Raining Men’, since the painting could resemble rain, but instead of water men are falling from the sky. Rene Magritte used oil paints and sometimes pastels on canvas to make his paintings. Rene Magritte’s work is very surreal for the most part, but to make his paintings surreal, what techniques did he use? Magritte usually made his paintings surreal by moving things to where they normally aren’t. The moving of objects to places where they can’t or wouldn’t be in real life makes the paintings surreal. All of Magritte’s paintings have quite realistic objects and settings, but the location of the objects usually aren’t realistic and are surreal. For example, it is not physically possible for it to rain men in suits or for someones face to be outside of their body. Magritte was influenced by many artists he met while in Académie Royale des Beaux-Arts, and was also influenced by artists like Picasso as well as cubism and futurism in general. He soon became one of the leaders in surrealist art. I think that Magritte is a great painter with good ideas to back up his paintings. He can paint quite realistically, but his ideas are surreal and make the paintings more interesting, and the realism of his painting mixed with the surrealism of his ideas make the paintings even more surreal. By realism of painting, I mean the way he draws people and objects with proportion and shadow, however the situations that these objects are in are very surreal. I chose to write about Magritte because he was one of the most influential surrealists of his time, and I liked the way he painted and his ideas. His paintings are all surreal and the ideas in his paintings seem pretty simple. Some of his paintings also have jokes in them which makes them interesting compared to other artists, since most artists don’t use jokes or humour in their paintings. Irena Zablotska is a Ukrainian artist. She does not have an age or much of a biography online, however I do know that she is a web/graphic designer who creates digital art. This is a digital piece of art made for .Cent magazine for the issue: ‘the space in between’, however I am not sure. This picture is at first kind of cute, and has nice colors, but after a while it is actually kind of disturbing. This fox is bleeding all over and has things coming out of its head, and is cut on its forehead. It also has two trees growing out of his head. The fox seems to be dead, but there are other living things on it. After seeing it for a while, it seems a little bit sad. This is an Illustration for “The Prime Russian Magazine”. This picture seems to be a bus going up a very two-dimensional road. This image is quite surreal because coming out of the wheels of the bus there are legs, and also because the bus has a face on the front of it, and in the windows of the bus there seem to be different backgrounds. There are also hands coming out of the end of the road. The bus also has a Beatles reference with the lyrics on the side of the bus. This image is quite dreamlike and soft of reminds me of ‘Thomas the Tank Engine’ which is a movie/show for young children about trains with faces. This is another one of Irena Zablotska’s pieces. It is called Aries, and was made for ‘Telegraph Magazine (UK)’. This is a very surreal piece, mostly because of textures and the other pieces of nature that are drawn on this goat-like creature. It is very colourful and has lots of weird stripe patterns on the legs and head of the goat. The goat is also holding a pipe, but instead of smoke coming out of the pipe, it seems like a tree is growing out of it. The body of the goat seems to be like a piece of nature, it has what seem to be strawberries growing on its torso and on its back there are mountains. There are also clouds coming out of its horns. The goat seems to represent something, like nature. It is dreamlike and semi-psychedelic with all of the colours in the picture. From these three pictures, we can see that Zablotska usually creates her images digitally, and I’m not sure these pictures could be made in any other way, since the colours are so bright. Her work is surreal, mostly because of the way she mixes nature with animals and also how she puts things in surreal situations. She also plays with scale sometimes, such as how the mountains on the goat’s back are tiny.